When I was a teenager living in Darwin in the late 1970s and early 1980s, I was very aware of the stream of young travellers that made their way to Asia from Darwin, some flying and many by boat. This journey took people from Australia to Timor, island hopping through Indonesia then Singapore, Malaysia, Thailand and then India and Nepal. Once in India, people would continue the journey overland until they made it to the United Kingdom. This journey was called the Hippy Trail. In the late nineteen sixties and early seventies, hundreds of thousands of youngsters from both sides of the North Atlantic took the journey overland from Europe to India, Nepal and beyond. Simultaneously, quite a few travellers from Australia came in via Southeast Asia and made the trip the other way round. From Western Europe the road led through former Yugoslavia, Greece or Bulgaria, Turkey, Iran, Afghanistan, Pakistan, India and Nepal. 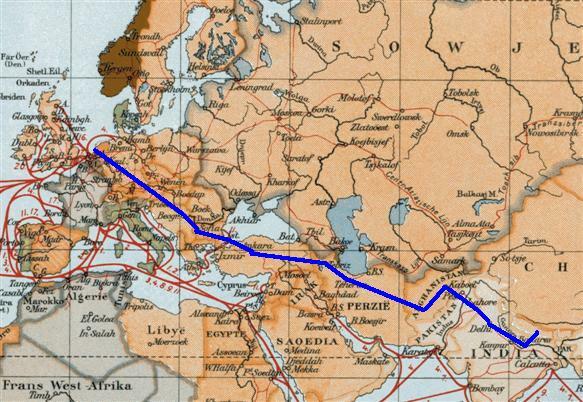 The one-way distance along this so-called ‘Hippie Trail’ was approximately 11.000 km (7.000 miles). An old Volkswagen van was the favourite choice of those who provided their own means of transport. Trains, cheap buses and hitchhiking were the modes of transport open to the others. Along the Trail, specialized budget hotels provided shelter and a place to meet other travellers. I have seen this quote on a few different sites and not totally sure if it is indeed a quote from Hans, so apologies if I have not correctly attributed these words. Hans also has a map of his journey. Anyway, since those days as a wide-eyed young person I have been fascinated by this journey. I have started to formulate a plan that would take us from Australia to the UK mostly by road (with the obvious exception of a couple of countries). We need to take this journey on the cheap; so will be calling out to our readers, using www.globalfreeloaders.com and www.couchsurfing.org to find accommodation along the way. We can also review accommodation and other travel services, so if you want your product reviewed, let us know. Although we are not young backpackers, we are still adventurous and to make this journey would be the realisation of a life-time dream. As the idea takes shape, I will be sharing with you more of our plans for this adventure. If you have done the Hippy Trail, we would love you to share your story with us too! I was, indeed, one of the many on that trail and in a manner of speaking, still am! Do you have a story you would like to share with us? Not right now. Though it was a most amazing time, one that shaped my life, I am still on the road and a life style traveler. I like to live in the now. Maybe one of these days I will tell some of the many stories that I survived!